Oh glorious summer! You’re slipping away so quickly. Thanks for the great times, Summer, for keeping the sun worshiping, south shore ocean dipping, lobster cracking, oyster shucking soul in me forever blessed by your sandy toes and your smoky barbeques. In August I got some news on the book front: the prolonged, mystical journey that has been my road to publication. The good news is that the marvelous, important Toronto Editorial Director that read White Butterfly both loved the memoir and gave me a lot of positive feedback on it, thus confirming that all of my hard work was worth it. The bad news is that she could not offer me a contract to publish, as she felt like it would better served by a different, smaller press. And so I carry on, holding my head high and believing in my work. Anybody who wants to leave comments like, how many times Anne of Green Gables was rejected before its final glorious acceptance (and so forth) are please welcome to do so! I immediately set pen back down to paper, while even writing some short fiction and resurrecting some poetry from my twenties, which now, I somehow seem chapters away from. There’s nothing like walking through your past to find the way to your future. Thank you, crazy Mo journals from the late nineties. 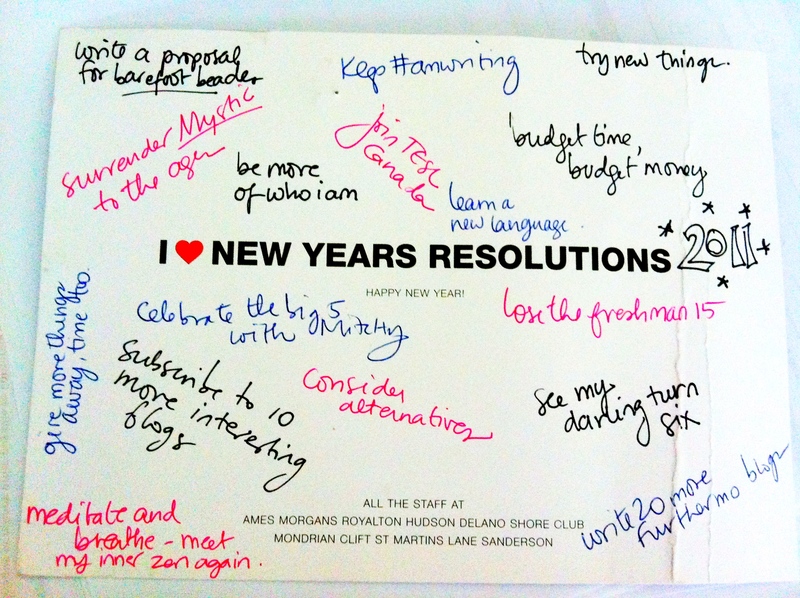 I also decided i should catch up with my New Years resolutions for 2011, and see how I was doing. Here was my general list. And so where are we, you ask? Well, let’s start with a few easy ones. Try new things. So far this year I’ve tried querying my book, writing short stories, traveling to China, and eating hemp seeds on my fruit and cottage cheese breakfast. I have yet to take up racket ball (minus one). Subscribe to ten more interesting blogs. Thanks to the miracle of Google Reader, I’ve hit the nail on the head with this one. Here are a few of my blogs scores of 2011. Dangerously Irrelevant: Technology, Leadership, and the Future of Schools, Write for Your Life, Let’s Explore: Play everyday, and for all you techies addicted to productivity apps, The Next Web. Oh, and I couldn’t forget Love Social, which I discovered on an Al Jazeera podcast. Learn a new language. I’m not sure if two weeks of Mandarin classes in Beijing count, but for the purposes of keeping track, let’s say that it does. Celebrate the big 5 with Mitchy. This we did in style, which if you missed the blog post about the Great Wall / our date, you can catch up with here. Be more of who I am. This is a bit esoteric, but I certainly don’t feel like I’ve been any less. More of myself might be too much for my poor husband to handle. Consider alternatives. I’m not sure where I was going with this one, but for anyone who’s asking, the answer is No, I did not change my Cows Ice Cream flavor at all this year. Cow-rispy Crunch is still the only kind for me. Join TESL Canada. This one I can shut the door on. Although I’ve been working in the field for years, after a teaching practicum in July, I officially became a “certified” ESL teacher. If anyone would like some help with their dangling modifiers, let me know. Surrender ‘Mystic’ and write a proposal for ‘Barefoot’. These are the nicknames for the large bodies of work that I have produced, and let’s just say that these are ongoing. Lose the Freshman 15. Don’t ask. See my darling turn six. Looking forward to this October date. Current theme is BRIDES. FAIRIES.PRINCESSES, and transitioning daily. Meditate and breathe. On the agenda – let’s slot this ‘inner zen’ program into, eeek, the last two weeks in November. Tell about how your year is going please! Have you met your goals? Share your accomplishments here so we can congratulate each other. Dare I review my own goals for 2012? I set them out on my blog in January, believing if you write them down and commit to them they’re more likely to happen. Good news is I’m meeting #1 and having my book published in 2012. I am hybrid (self/traditionally) publishing, does that count? I do wish you well with your manuscript and having pitched three now, can confirm it takes multiple drafts and tons of queries to get results. And time. Years. I’m doing so-so meeting the others (#2 eat well and exercise, yes; #7 read good writing and write good reading, yes and no; #10 work hard but not stress over schoolwork, no. Stress is my constant companion). Thanks for the prompt, there are a few months of 2012 left so I better get busy. You sound like you’re well on your way! Congrats Alyson! I’ll keep the queries going. I like #7: read good writing and write good reading. I’ve got several interesting anthologies on the go. 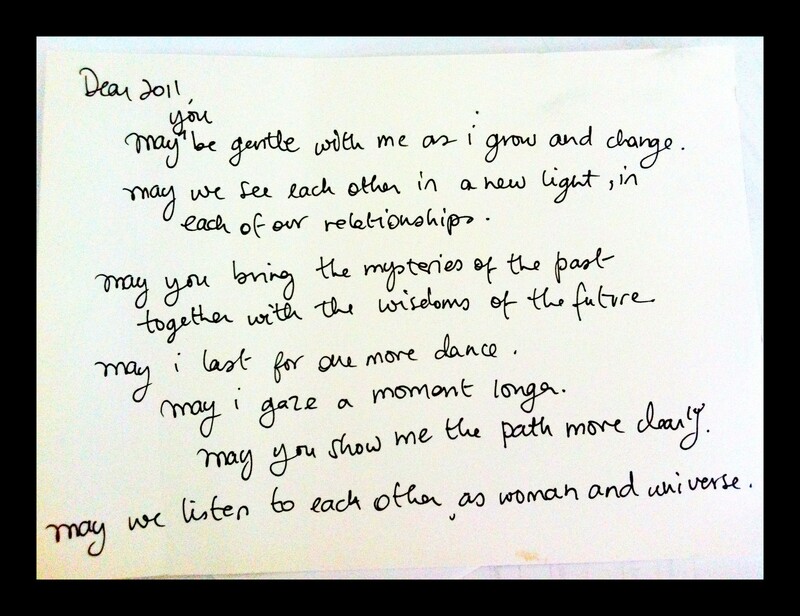 I appreciate your comments, and good luck with the rest of your intentions for 2011. Can’t wait to see that book come out in 2012.
my resolutions are not so organized but you’ve inspired me to do a better job at that next year. let’s talk about those crazy mo journal entries from the late nineties!? wow, there must be some real gems in there. Bringing Leo into the world counts for a lot, Ro, and I’d say you can give yourself a few months off now!